After you’ve determined a record truly is for your ancestor, you’ve got several options for what to do with that record in FamilySearch.org and in your personal family history record files. When you find a genealogy record on FamilySearch.org, you can save it, copy it, print it, download it, and more. FamilySearch.org’s Source Box is a great tool that lets you keep all the records you find in one place. It provides citation information so you can always remember where you found the record—and that you even found the record in the first place. Add this source to a person in your FamilySearch Family Tree by clicking the Attach to Family Tree button (you’ll see this on the records window when you view your search results). FamilySearch.org will automatically match the record to a relative in your tree, if you’ve already created a family tree on the site. If you keep hard-copy files of your ancestor finds, you can click on the Print icon at the top of the record detail window to print a copy. The Copy icon at the top of the record detail window copies the text from the record result page and allows you to paste it in a document. For example, you would click the Copy icon, open a new word processor document or Evernote note, then paste the text. This is helpful when no record image is available, or you want the record contents to be searchable in your research notes. If your record result includes a record image, you’ll want to download a copy for your personal files. 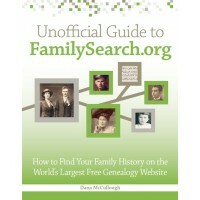 Record images may be directly on FamilySearch.org, or may be accessible through a partner site such as Ancestry.com. If it’s on FamilySearch.org, simply click on the Camera icon in the search results, then click the Download link to download the current record shown on your screen. A JPG image of the record will download to your computer; you can move it to the appropriate folder where you keep genealogy record images. You can share your record finds via social media on Facebook, Twitter, and Google+, as well as via e-mail. To access these sharing options on FamilySearch.org, click the down arrow next to the Share icon on the record results page. Take closer look at the information provided in the record. Does a death record list the street address of your ancestor or of the person providing information for the record? Does a census record include the year your ancestor immigrated to America? Does a marriage license include the religious affiliation or church name where the wedding ceremony occurred? These bits of information could be valuable clues as you continue your research.